Honey Whole Wheat Challah... with the addition of whole wheat, and sweetened with honey. Michell Jenny's Challah... with butter. Apple Challah... inspired by the many delicious apples. Everything Challah... inspired by the everything bagel. Peanut Butter Bread... I really want to try this as challah. Cinnamon Scented Challah... with cinnamon and topped with almonds. Braided Challah with poppyseeds and lemon... and saffron! I'd like to try it with etrog juice post-Sukkot. 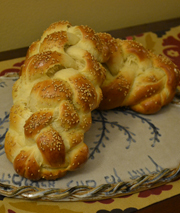 Potato Challah... this is a family-sized recipe but it can easily be halved. Sweet Potato Challah... great for Thanksgiving. One thing you won't see here ever is raisin challah. Because raisins are grooooosss!!! !